The view that post fire (salvage) logging diminishes fire risk via fuel reduction and that forests will not adequately regenerate without intervention, including logging, is widely held and commonly cited. Donato et al (2006) highlights an alternate view which states that post fire logging is detrimental to long term forest development, wildlife habitat, and other ecosystem functions. Natural conifer regeneration on sites that experienced high severity fire can be variable, but generally abundant. Post Fire logging in forests burned in the U.S. substantially reduced regeneration by 71 percent due to soil disturbance and the physical burial by woody material during logging operations. This was found to provide no net gain in regeneration (Donato et al 2006). Donato et al (2006) found that Post fire logging significantly increased both fine and course downed woody fuel loads. This wood was composed of unmerchantable material, and far exceeded expectations. In terms of short-term fire risk, a re-burn in logged stands would likely exhibit elevated rates of fire spread, fire-line intensity, and soil heating impacts. The lowest fire risk strategy may be to leave dead trees standing as long as possible, allowing for aerial decay and slow, episodic input to surface fuel loads over decades (Donato et al 2006). Post fire logging is conducted in disturbed ecosystems. It resembles clearfelling, but the disturbance order is reversed. Forests are initially burned by an unplanned wildfire. Then they are clearfelled with all merchantable trees removed (Lindenmayer and Ough 2006). The sizes of the logged areas can be large and exceed 120 hectares subject to forest management approval (DSE 2003). Questionable assumptions are used to justify salvage, which include the perception that naturally disturbed areas have limited value for biota. That damaged trees will attract insects that will attack adjacent undisturbed stands, and that dead trees create abundant fuels and an increased fire risk and threat to public safety (Lindenmayer and Noss 2006). There is the perception that wildfires are disaster zones that require ‘cleaning up’. In contrast it has become clear that natural disturbances are key processes in the majority of ecosystems. An increasing body of evidence indicates many species have evolved with, and are adapted to, various types of natural disturbance (Lindenmayer and Noss 2006). The intensity of wildfires is highly variable. Although high intensity fires in montane forests can be over-storey replacing events, they nevertheless, leave behind many kinds of biological legacies. Many large diameter living and dead standing trees remain in many stands of young montane regrowth montane forest. Wildfires also significantly influence conditions on the forest floor because trees that are killed and collapse become key habitat components for a range of vertebrates (Lindenmayer and Ough 2006). High intensity over-storey replacing fires represent one disturbance pathway in montane ash forests. Lower intensity fires lead to partial stand replacement because many trees survive. Regeneration of young trees in these forests creates multi-aged stands comprising of two or more distinct age cohorts. The understorey is also multi-aged (Lindenmayer and Ough 2006). The majority of post disturbance logging in Victoria has taken place following wildfire. Post fire logging has taken place following wildfires occurring in 1926, 1932 and 1983. Montane Ash Forest burned in the most extensive wildfire of 1939 was logged until the late 1950’s. Most accessible burned areas outside the closed water catchments were logged during this time (Lindenmayer and Ough 2006). Postfire Logging results in the further depletion or loss of key forms of biological legacies such as large burned logs, thickets of vegetation that are resistant to fire, and large living and dead fire scared trees with hollows in addition to that of conventional clearfell logging. Large trees killed by a wildfire can remain standing for over 50 years in an un-logged burned forest. Conversely, fire killed trees are more likely to collapse when the surrounding forest is logged and the remaining slash is burned in a high intensity fire applied to promote regeneration. In this case, two fires, (a wildfire and a post harvest regeneration burn), in combination with logging impacts, give greater susceptibility to collapse than a single wildfire (Lindenmayer and Noss 2006). The reduction in the abundance of such legacies can have flow on negative effects on biota that are dependent on them. The removal of these structural legacies can be followed by prolonged periods before new legacies are created (Lindenmayer and Noss 2006). Large living and dead trees with hollows in montane ash forests are subject to a rate of collapse that are estimated to be approximately 4 percent of the population per annum. Although burned hollow trees in stands subject to post fire logging are exempt from cutting, it is likely that their collapse rates are higher because they are subject to increased exposure to altered micro-climatic conditions when the remainder of the surrounding forest is cut down (Lindenmayer and Ough 2006). 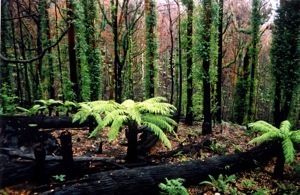 Post fire logging can alter plant species composition. Seedlings germinating following the fire can be damaged through mechanical damage imposed on them through post fire logging. Post fire logging within the first few years after wildfire is likely to reduce the survival of many plant species. Post fire logging is a double disturbance in which mechanical disturbance takes place after wildfires have stimulated many plant species to regenerate. 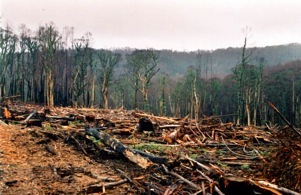 The movement of logging machinery and the felling of trees will kill many of the recently regenerating plants. Plant communities in post fire logged forests are most likely to be dominated by a smaller suite of species (Lindenmayer and Ough 2006). Post fire logging often impairs key ecosystem processes such as hydrological regimes, cavity tree formation, soil profile development, and nutrient cycling. In contrast to the natural recovery of a disturbed ecosystem, post fire logging has the potential to ‘convert a relatively intact system to a strongly modified site in which ecosystem control is reduced’. 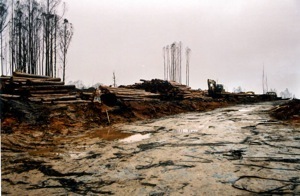 The sediment catching role played by logs is lost when they are removed, which may lead to significant impacts on aquatic ecosystems (Lindenmayer and Noss 2006). In the case of wildfire, there can be a range of intensities and frequencies that give rise to a wide range of forest conditions. High intensity fires occur on average, every 120-200 years or more in frequency, typically resulting in an even aged montane ash forest. Low to moderate intensity fires over moderate to long frequencies (>150 years) are more likely to give rise to a multi-aged over-storey because not all dominant trees are killed. Multi-aged stands are important because the overall diversity of arboreal marsupials is higher in multi-aged forest and several species respond positively to the combination of old trees and dense understorey regrowth typical of multi-aged forest (Lindenmayer and Ough 2006). 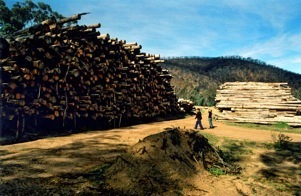 Only 9 percent of montane ash forests in the Central Highlands of Victoria are presently multi-aged. Results noted by Lindenmayer and Ough (2006) show that up to 30 percent of montane ash forest burned in the 1939 wildfire may have been multi-aged at the time they were burned. This is a reduction by more than two thirds. The widespread post fire logging following the 1939 fire has resulted in many of these stands being converted to a largely even aged forests (Lindenmayer and Ough 2006). 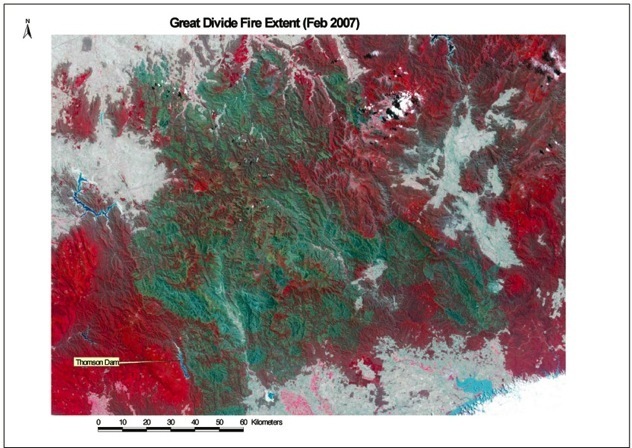 It has been this the Postfire logging that has resulted in the dramatic decline of the Endangered Leadbeater’s Possum in recent years, some 60 years following the postfire logging operations (Lindenmayer 2004). Many post fire-logging decisions are made without the scientific background of management as agencies seldom have this information. 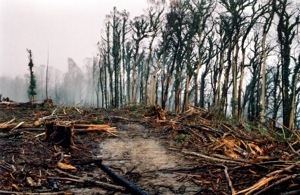 Many decisions to log before or after a disturbance or to attempt to increase forest resistance or resilience to disturbance and stress are based on the incorrect notion that forest ecosystems are damaged, destroyed, or impair following a major disturbance and that this situation should be avoided or remediated (Foster and Orwig 2006). Foster and Orwig (2006) note that for naturally disturbed forests, leaving the forest intact may be the preferred approach. Given the long-term impacts of Postfire logging following the 1939 Wildfire, such an approach needs to be considered by Government. Bushfires started by lightning strikes on the 1st December 2006 have burned over 1 million hectares of forest in the Victorian Alpine Bioregion. The VicForests have advised on the intent to commence a large-scale ‘salvage logging’ program aimed primarily at logging the fire affected ash forest species (VicForests 2007). The area of ‘mature’ merchantable ash forest ‘killed’ in by the fires is in excess of 10,000 hectares. VicForests have assumed a yield of 300 cubic metres per hectare, which represents a standing volume of 3 million cubic metres. A full analysis is yet to be completed as of the date of writing. Logging crews have commenced Postfire Logging in some areas with the program scheduled for full implementation by early February 2007. It is when post fire logging is conducted in disturbed ecosystems. It resembles clearfelling, but the disturbance order is reversed. Forests are initially burned by an unplanned wildfire. Then they are clearfelled with all merchantable trees removed (Lindenmayer and Ough 2006). The sizes of the logged areas can be large and exceed 120 hectares subject to forest management approval (DSE 2003). 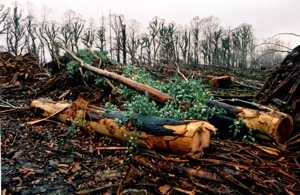 Lindenmayer and Noss (2006) broadly define salvage logging as the removal of trees and other biological material from areas after natural, or sometimes human caused, disturbance events. 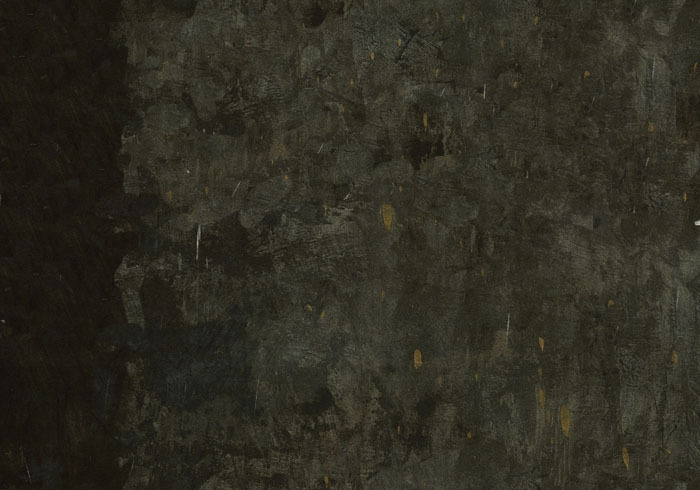 They note that the term is misleading, as salvage is associated with ‘recovering’ or ‘saving’. 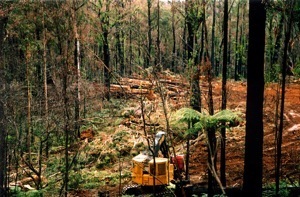 Although salvage logging ‘removes’ logs from a burned area, such practices are to the detriment of the regeneration and health of the ecosystem and is seen by Lindenmayer and Noss (2006) as inappropriate. They have adopted the term Post Disturbance Logging. For the purposes of this review, the term Post fire Logging as used by Donato et al (2006) shall be used. 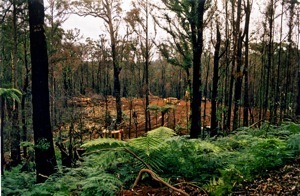 Current forest management practices on public land in Victoria have been of significant concern to a number of scientific and community interests since the early 1970’s (Dargavel 1995, Mackey et al 2002, Lindenmayer and Franklin 2002, Davies et al 1993). 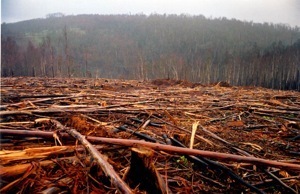 The application of clearfell logging to he majority of logged over areas is seen to be a homogenisation of the forest landscape. Structural and floristic complexity developed through past biological legacies over long periods of time are lost as current logging practices fall outside the natural disturbance history of many forest ecosystems upon where it is applied (Mackey et al 2002, Davies et al 1993). The salvage logging following the 1939 wildfire had a significant impact on forest structure. Lindenmayer and Noss (2006) state that the pronounced depletion of live and dead hollow bearing trees has affected more than 40 species of vertebrates and is a major biodiversity conservation problem that will take more than 200 years to rectify. 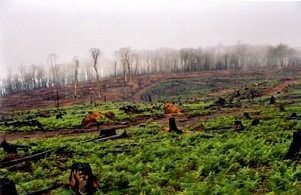 Mackey et al (2002) state that Postfire Logging has erroneously reinforced the view that clearfell logging is ecologically congruent with natural disturbance regimes. The impacts of Postfire Logging are reviewed in greater detail below. Scientific data directly informing the impacts on Postfire Logging are lacking (Donato et al 2006). The key issue is whether the impacts of post fire logging are different from, and potentially more detrimental than, other forms of logging that are not preceded by a major natural disturbance (Lindenmayer and Noss 2006). With Postfire Logging, additional negative impacts are experienced in the disturbed forest further to what would be experienced with conventional logging. Overall, Lindenmayer and Ough (2006) have found that there is a striking difference between forests that were post fire logged following the 1939 wildfire, and those in the closed water catchments that were not. The abundance of hollow dependent species between the logged and un-logged forests is significant, with greater populations of mammals being observed within un-logged forests. Wildfires promote the development of cavities in large trees within the burned forest. These provide nesting and foraging sites for more than 40 species of vertebrates. Wildfires and windstorms also generate pulses of large fallen logs, and these provide an array of ecological roles (Lindenmayer and Ough 2006). These are outlined below.